INKin' All Night! : Weekly Deals & New Round of Club! 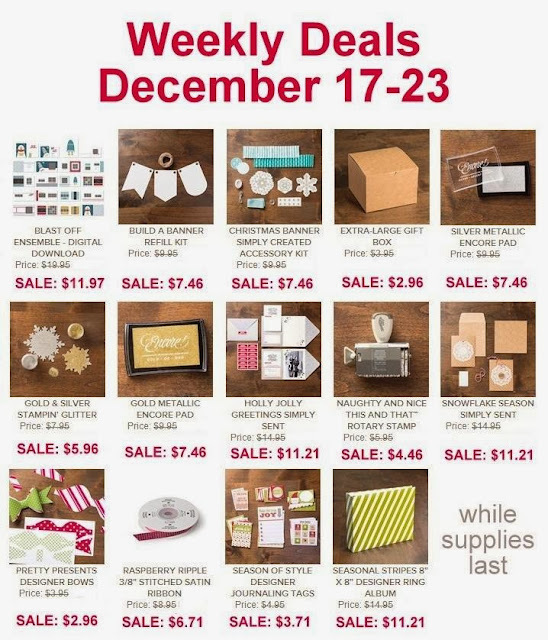 Here's this weeks WEEKLY DEALS, when you shop online you can combine any product you want on your order so be sure to check out the What's New Section, the updated Clearance Rack, Valentine's Products, Digital Downloads and more ...! Shop for any of your stamping needs at my online store, open 24/7 and it ships right to your front door! I'm also starting a NEW round of my MONTHLY STAMPERS CLUB for the months of Dec-May so please let me know ASAP if you're interested in adding to your stamping or scrapbooking or paper crafting collection on a reasonable monthly budget! We meet monthly (optional to attend, you can also do it online too) and I provide a few make-n-take projects, you place your orders, open time for Q&A about products you want to know more about. Each club member rotates a turn to get to be hostess and enjoy the Freebie Hostess Benefits. Catalogs and Mini Catalogs are always free to club members too! Email me at rhonda@inkinallnight.com if you're interested, clubs start this month!